I thought up the title and now I need a tagline? Not a chance. My alarm went off at 7am and I actually got up (Beth not so much). The weather was gorgeous so I took Maeby for a walk. Having arrived in the campsite after dark it was my first opportunity to see our surroundings. I walked her down to Legion Lake where we saw a couple large piles of animal poo. I know Custer State Park has a small bison herd but this was all we saw of them. There were three or four deer up on the hill across the road. Fortunately, Maeby didn’t notice them and I was able to observe them for a couple minutes before they ran off. We rejoined Beth and packed up our stuff. Our first stop of the day, Jewel Cave, wasn’t terribly far away. Jewel Cave is very much an inside, non-dog friendly activity but when I was planning the vacation, Beth offered to let me take the tour. She saw it as a kid with her family on one of their many cross-country trips so I accepted her generous offer. I got in a short line as the ticket booth opened and got a spot in the second tour of the day. Beth went to nearby Custer, SD for some coffee (she’s not a fan of being up early). Jewel Cave was fun as hell! My tour group was about twenty people, five or six of which were kids. We took an elevator (in two groups) down 300 feet into the third longest cave in the world. Our guide, a park ranger, told us that only the known length counts towards that ranking. Additionally, by measuring the air turnover in the cave, researchers believe that only approximately 3-5% of the cave has been discovered. That’s right, only 3-5% and it’s already the third longest cave in the world at 175 miles of explored area! It used to be second longest but two large caves in Mexico were found to be connected. The longest known cave is Mammoth Cave in Kentucky. The tour brought us through several interesting caverns. Our guide told us to refrain from taking pictures while walking up and down stairs to avoid potential injury but I found that difficult. Photography enthusiast that I am, I hung out near the back of the line so I could take as many photos as I wanted without holding up the line. I know, I’m a rebel. Less than 1% of the known cave length is classified as “wet” but the tour took us through one of the wet caverns. Water dripped on us as we walked through that section. Neat! Some of the formations on the cave walls were green, covered in algae. Most of the cave was white (Calcite), black (Manganese) or some shade of reddish-brown (I don’t remember what those were). In one room our guide turned off the lights so we could experience total darkness. She said that if we held our hands in front of our eyes and moved them back and forth really fast it would help us regain our night vision. She then turned the lights back on and revealed she was just messing with us. I’ll admit, I fell for it. She informed us there was no way to see in total darkness. As our tour went on through the various caverns I learned a ton but perhaps the coolest bit of knowledge provided concerned cave exploration. Apparently, the only exploration in Jewel Cave is done by volunteers on four day excursions. That’s the maximum amount of time anyone is allowed to be in the cave. Those brave enough to climb deep into the unknown have to go through a lot just to get to the edge of previously discovered territory. Expeditions must first go through a series of difficult passages. First is the ‘Miseries’. Let that name sink in. The Miseries. This natural obstacle is 1100 feet long and has to be crawled through while dragging your pack behind you. After the Miseries is the ‘Mini Miseries’, 700 feet long and even shorter at about a foot tall. Then, after crawling and sliding for 1800 feet, explorers must squeeze through an eight inch gap called the ‘Calorie Counter’. All these obstacles and the distance of about seven miles are why it takes about eight hours to make it to base camp. Camp is made in the largest discovered cavern called ‘The Big Duh’ (570 feet long, 180 feet wide, and 30 feet high at its tallest). Everything the explorers bring in must be brought back out to protect the natural ecosystem, even their human waste. The good news is they don’t have to drag in their own water supply as filtration systems in the Big Duh gather and filter enough drinking water for the crew’s time there. Actual exploring is limited to about 18 hours after the required traveling and necessary sleep. It’s important work, though, as five to seven miles of new passages are discovered each year. Imagine how happy they would be if they discovered another, more accessible exit! My tour lasted about an hour and a half (it ran a little longer than it was supposed to). 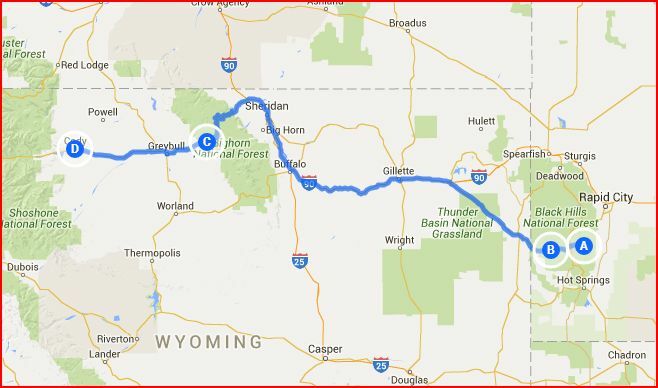 I reentered the sunlight above ground and we continued our trip West toward the Wyoming border. We were hungry but as we entered a small town I said we were likely to see a Subway and a Pizza Hut and that’s it for options. Two minutes later we saw a Subway and a Pizza Hut right next to each other with no other restaurants around. NAILED IT! We decided to wait until we entered a more populated area with more restaurants. The scenery changed from bluffs to grassland and then we saw mountains off in the distance. My family took this same section of highway when I was 16 on our trip out West but I don’t remember the Bighorn National Forest being so beautiful. Perhaps I was reading Harry Potter and the Goblet of Fire instead of paying attention, who knows? This time through, I paid full attention. The Big Horns are gorgeous and quite tall. We weaved in and out of switchbacks along the red cliffs. Beth was driving so I could take a lot of pictures. Feast your eyes below on some of the excellent scenery I missed when I was 16. It was a lot of fun twisting around the tight turns of the Big Horns. Before exiting Big Horn National Forest we stopped at Shell Falls on the Eastern edge. We didn’t have that far to go on day two so we could take our time and stopped to check it out. The dog wasn’t allowed on the paths so we took turns. While Beth was gone I popped the hood on the car to cool the engine down after forty odd miles of climbs. We switched and while I was gone a Park Ranger approached Beth and asked if we needed car assistance. The views of the falls were pretty good. I took the long route around accidentally and saw the river from a long way up. I’m not a fan of heights but I appreciate a fantastic view. The rapids below were no joke either. The Falls measure 120 feet high. Some lady was taking photos of her kid for what looked like Senior Pictures. She was in the way. Our accommodations for the night were an hour away in Cody, Wyoming in the home of JT and Rayna Malmberg. JT and Rayna go way back with my parents. We stayed with them for three days on my family’s Western trip in 2004. The couple once lived in Minnesota, where Rayna is from. In fact, despite not being blood related to us, her maiden name is Knutson! The Malmbergs were very generous to offer us a room for the night and also a home-cooked meal. Lasagna was on the menu and good conversation was for dessert. Also, ice cream. There was ice cream. Maeby and their dog didn’t fully get along but there were no all-out brawls. End of day two.